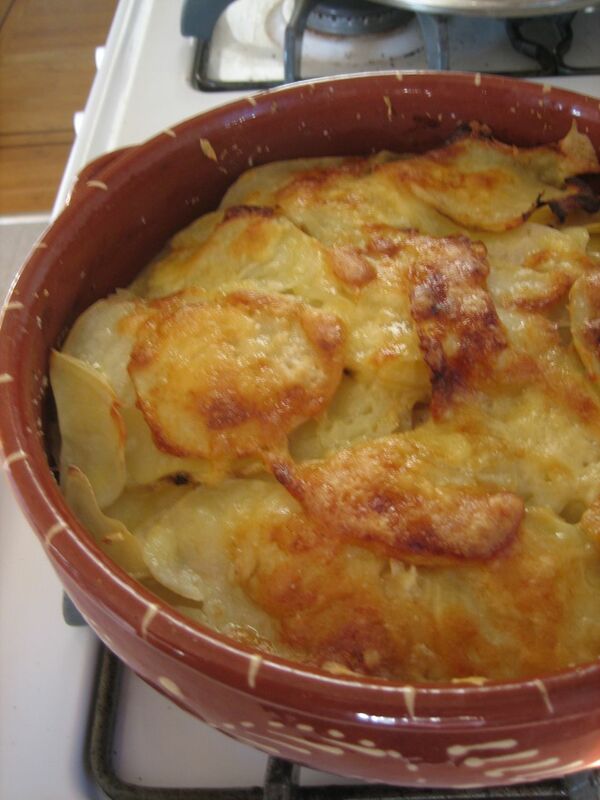 Layering sliced potatoes with sautéed leeks and grated cheese into a Potato Leek Gratin makes short work of a cold weather dinner. Serve it as a hearty side dish with a roast or as a main dish with a tossed salad or cooked greens for a simple but satisfying dinner. Preheat an oven to 375 F. Clean and chop the leeks: Cut off the root ends and dark green leaves, slice the white and light green part in half lengthwise, chop, put in a colander, and rinse clean with cool water. Rinse thoroughly, since grit and dirt tend to hide between the layers of leeks and a gritty gratin is no fun. In a medium frying pan over medium heat, melt 2 tablespoons of the butter. Add the leeks and cook, stirring frequently, until wilted and a bit softened (about 3 minutes). Set the leeks aside. Rub a 2-quart baking dish or gratin pan with the remaining butter. Set the prepared pan aside. Peel the potatoes and cut them into 1/4-inch slices (even is more important than thin—if you have a kitchen mandoline, this is a good time to use it, but a sharp knife and a steady hand can also do the job). Cover the bottom of the dish with 1/4 of the potato slices and sprinkle with salt and pepper. Spread 1/2 of the cooked leeks on the potatoes. Layer another 1/4 of the potatoes. Sprinkle with 1/2 of the cheese. Repeat the potato, leek, potato, cheese layers, sprinkling with salt and pepper at each potato layer that doesn't get topped with cheese. Cover the dish and bake 20 minutes. Uncover the dish and continue baking until the potatoes are tender when pierced with a fork and the whole thing is a lovely bubbling brown on top, about 25 more minutes (depending on how fresh the potatoes are, cooking time may take as long as 90 minutes—cover the dish if the potatoes and cheese become too brown). Serve hot. Make ahead note: Since peeled and sliced potatoes turn brown easily and frozen potatoes take on a mealy texture, this dish isn't super easy to make ahead of time. One trick is to par-bake it: bake the dish, covered, for 30 minutes, remove from the oven, let cool, and chill up to two days, then put back into a hot oven and bake covered for 15 minutes then uncovered until nicely browned. Another option is to prep all the ingredients, and then assemble and bake it when you're ready. Chop and clean the leeks, keep covered and chilled up to 3 days. Peel and slice the potatoes and keep them, in a large bowl covered with water, covered and chilled up to overnight. Drain and pat dry before using. This approach doesn't save tons of time but shifts the type of work that needs to be done when it's time to get dinner on the table.